Workaholic. The Alienware S-4 m5550 is a powerful notebook - No, actually the notebook with the highest performance, which passed our reviews so far. How does this work? Core 2 Duo T7600 2.3 GHz, 2GB RAM Dualchannel and a 80GB 7200 revs Hdd. 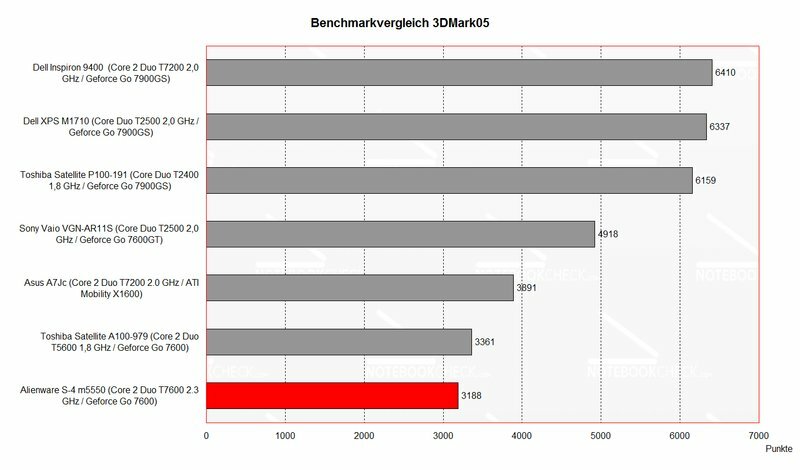 On the contrary, only the Geforce 7600 seems to be a little old. Somehow, I felt like I were already familiar with this notebook. You ask: "Why"? Have a closer look at this notebook. Have you got it? 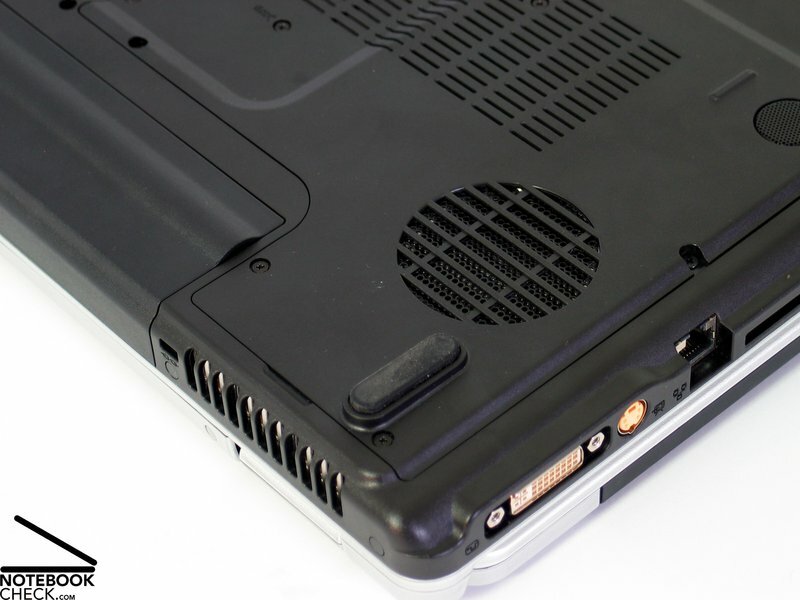 The FSC Amilo M1437G seems to be the same notebook, at least regarding its appearance. Of course, the inside of the S-4 m5550 is different, but we will look at this a little later. However, one can attribute it a passable workmanship. Under pressure the case partly yields, especially at the bottom side, however, one can't hear any creaking noises. The flexural rigidity could be better. 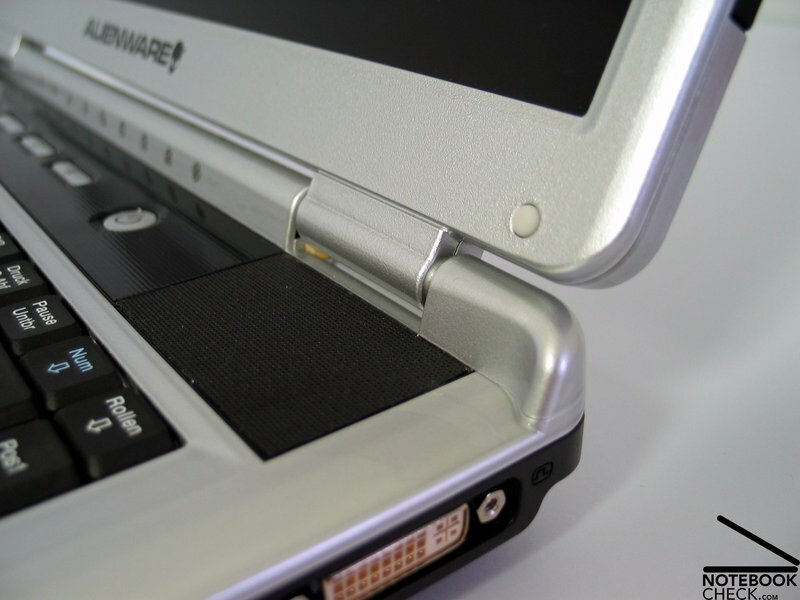 If the notebook is picked up at the front side near the Expresscard slot, one can observe slight torsions. 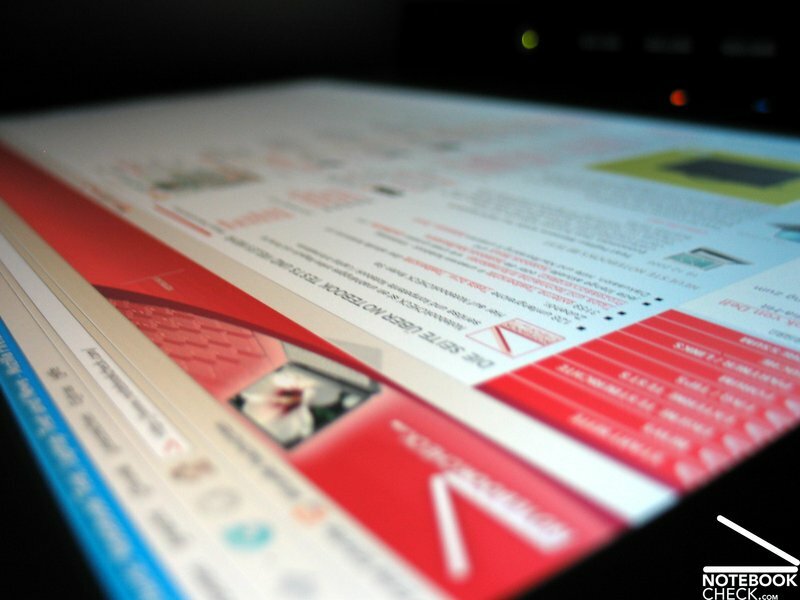 The display's hinged lid allows to adjust the display's position by applying optimal force. However, the display hereby seesaws a little bit. The ramshorn hook keeps the display securely closed, we could not detect any wobbling. The interfaces are all together at the left side near the back and at the right side. 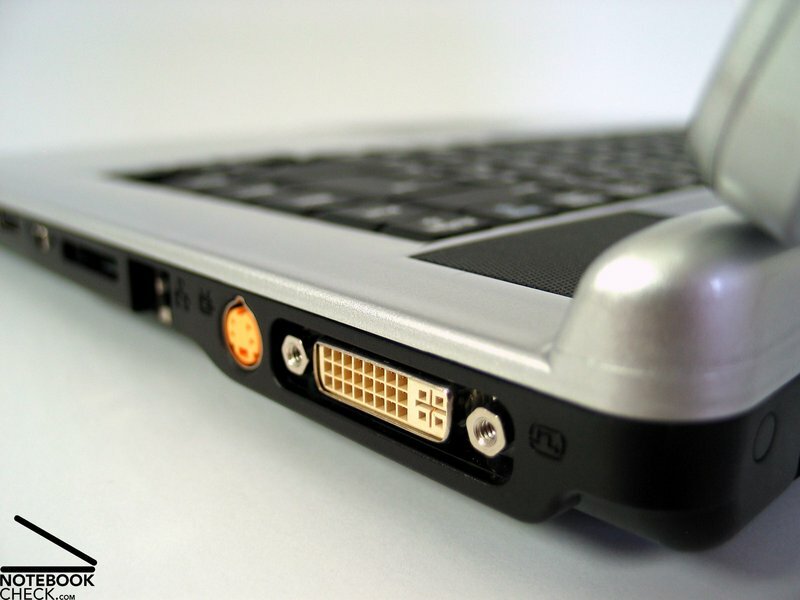 In our opinion, the LAN port is somehow disadvantageously placed nearly in the middle of the right side. With my current desk layout, this would mean that the S/PDIF Port is used at the left side, behind it 2 USB ports (mouse and external hard disk) as well as the power connector round the corner at the back side. Now, only the LAN connection is missing. The LAN cable must be connected at the middle of the right side and limits the place for mouse movements, because I am a right hander. In this respect, left hander would have an advantage, however, they must live with audio ports at the left side near the front. The notebook's keyboard is not especially optically structured. 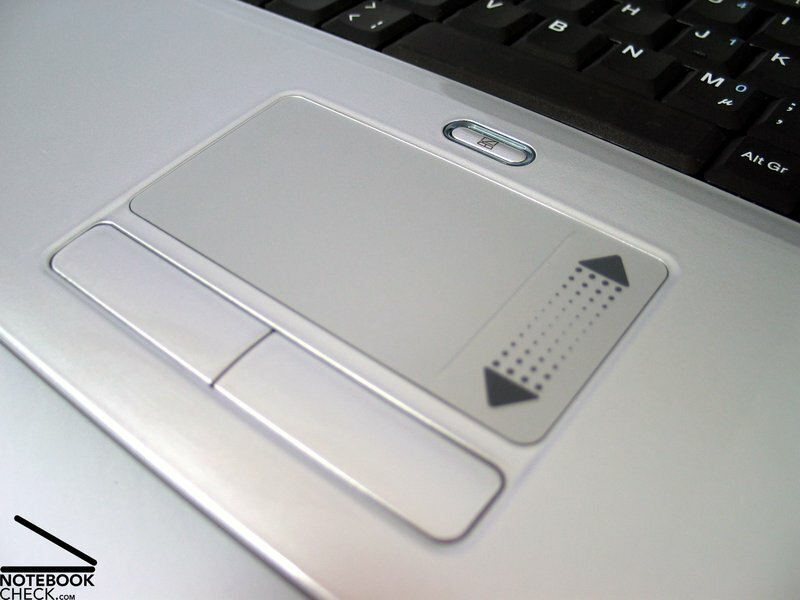 Only the cursor keys were moved a little bit off the other keys and is therefore easy to use. The order of the other keys seems a a little bit arbitrary to me. E.g., Ins. and Del are right beside the space bar and there is a key block right beside the enter key. 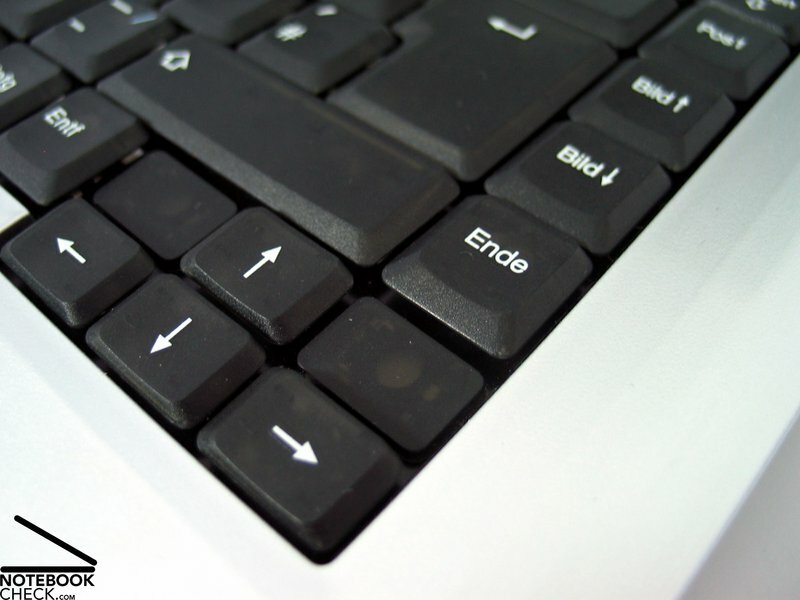 However, the enter key extends over two rows and is therefore easy to use. 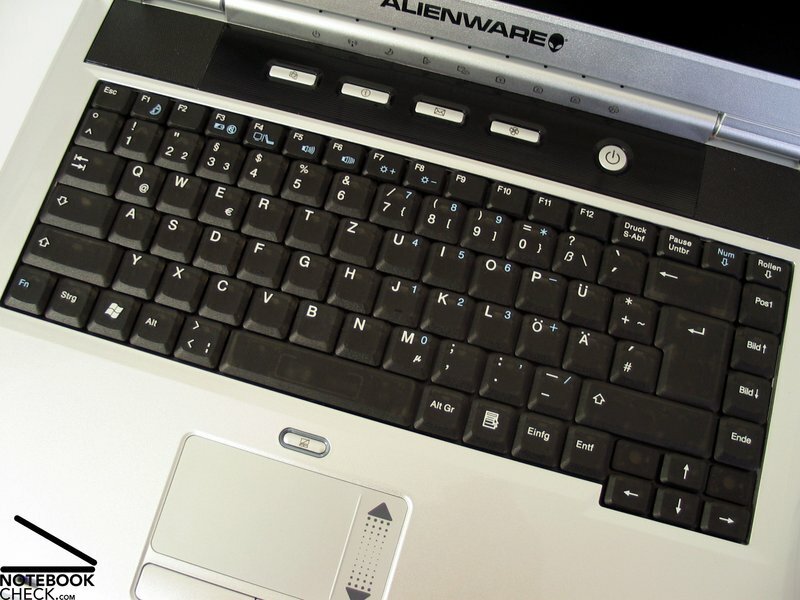 Regarding the size of the key the Alienware S-4 m5550 is very generous. 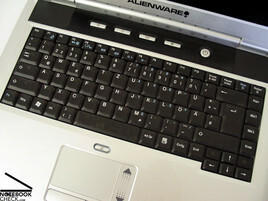 All the digit keys are of good size and function keys like Shift, Tab etc. are even a little larger than usual. Typing feels soft with a clear point of pressure and a gentle stop. The noise emissions caused by typing are low. 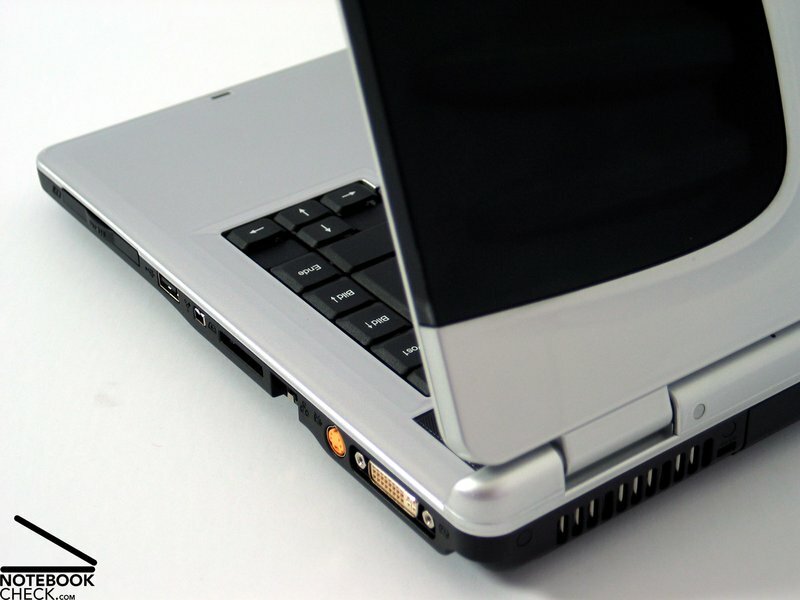 The touch pad has a comfortable surface and does not have any anomalies regarding response or precision. The scroll region at the right edge of the pad is especially spacious. A slightly higher region of the pad's surface between control and scroll region helps even quick fingers to find their way. Both buttons can be used at their whole extent, but one needs to apply enough force to activate them. Positive: Above the pad there is a separate button, which allows to easily and quickly deactivate the touch pad. Above the keyboard there are some additional keys, which can be used to start the mail program or the WWW browser and a key for limiting the processors performance. vision has to be good enough to be still able to recognize everything which is displayed at this extremely hight resolution (147dpi). The maximum measured brightness is below-average at 136.3 cd/m² with a good illumination of 82.8%. The measurement diagram does not uncover any anomalies. 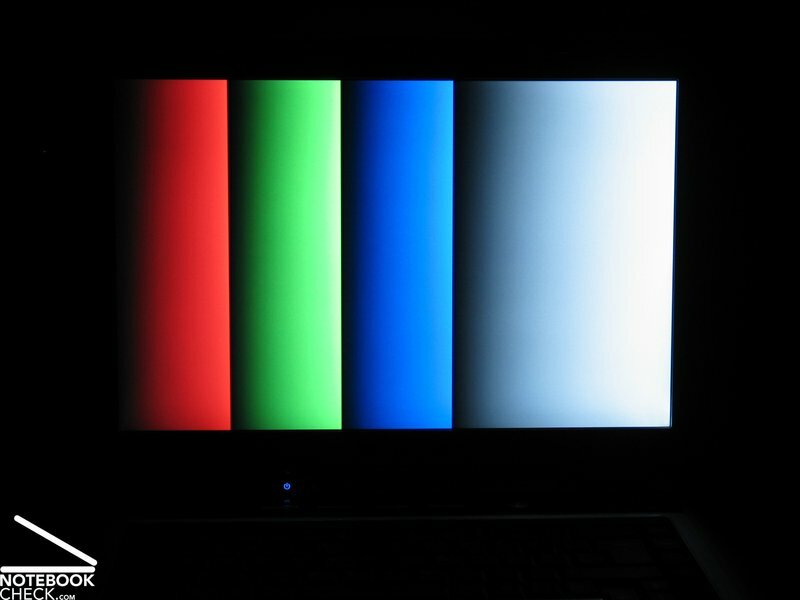 Only the usual deviation of the blue color curve, which leads to warmer colors, gets apparent. 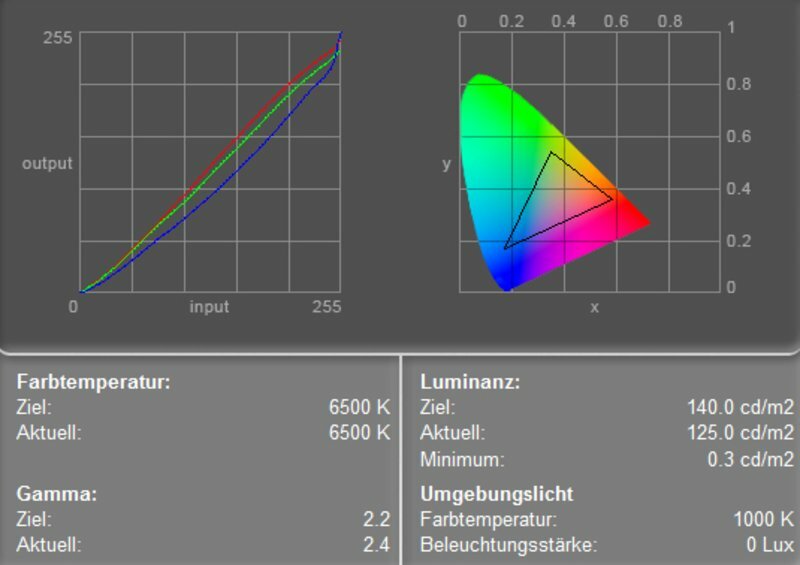 The minimum brightness (black value) is very low at 0.3 cd/m² which leads to an excellent contrast ratio of 454:1. The notebook rated grade 6 in the Pixperan test of legibility, which is an average result regarding its speed of reaction. 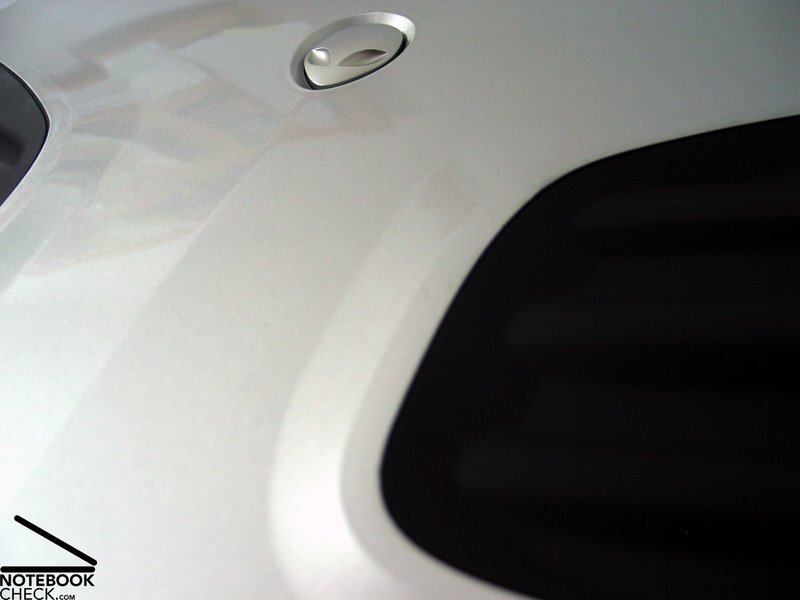 Because the display is non-reflecting, it has matt surface instead, it can be used very good outdoors. The brightness is sufficient, and there are no reflections at all. A non-reflecting display is rare feature, which notebook's of the playable multimedia class do not normally provide. 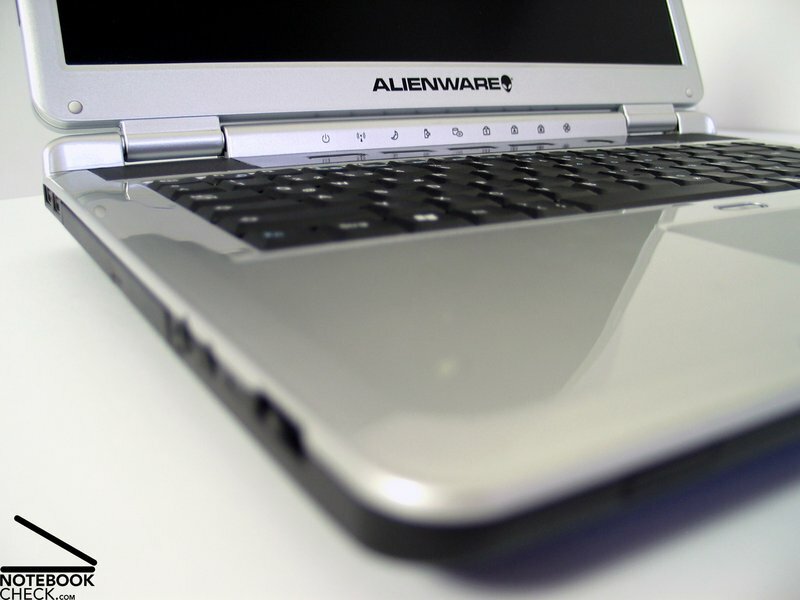 A further plus of the Alienware S-4 m5550. Regarding the possible vantage points the area of operations is sufficient. 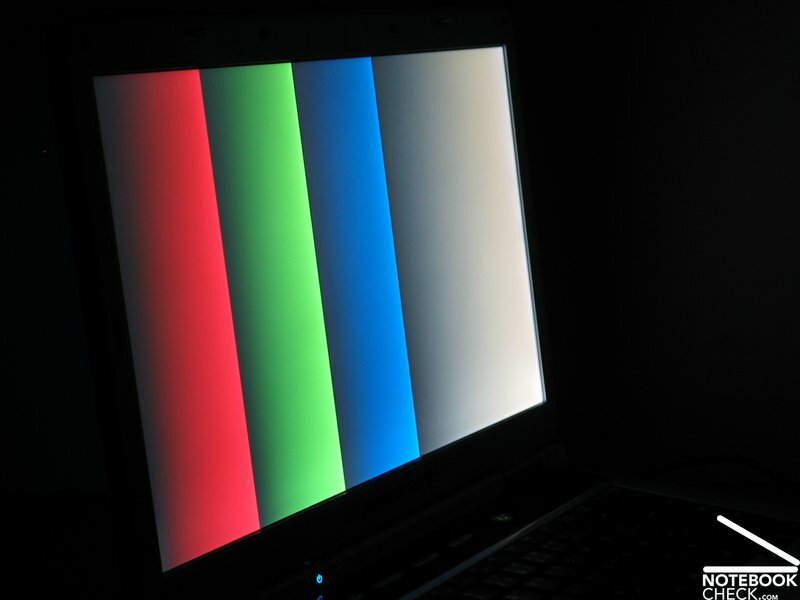 Horizontally, the contrast diminishes at acute angle, whilst vertically, the display gets brighter or darker, as usually. 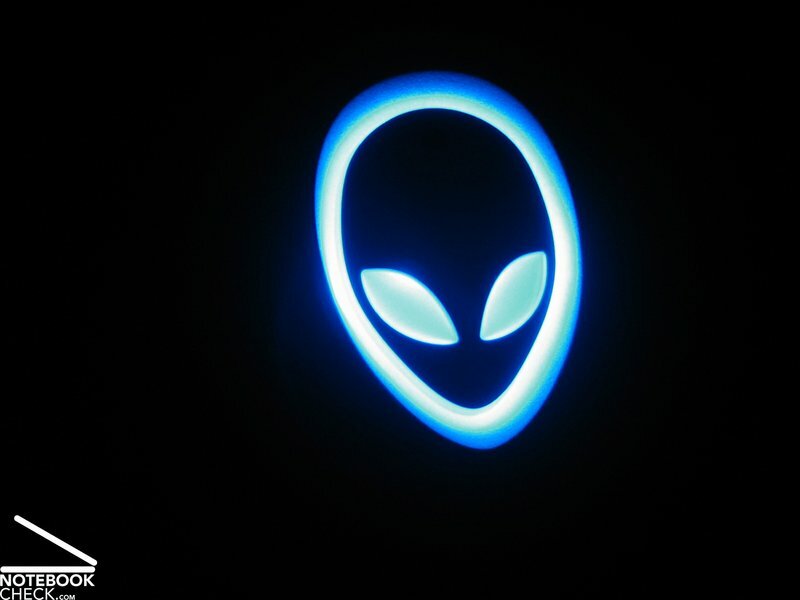 As already mentioned at the beginning of this article the Alienware S-4 m5550 is really powerful. It's legitimate to say that the full potential was tapped regarding application performance. 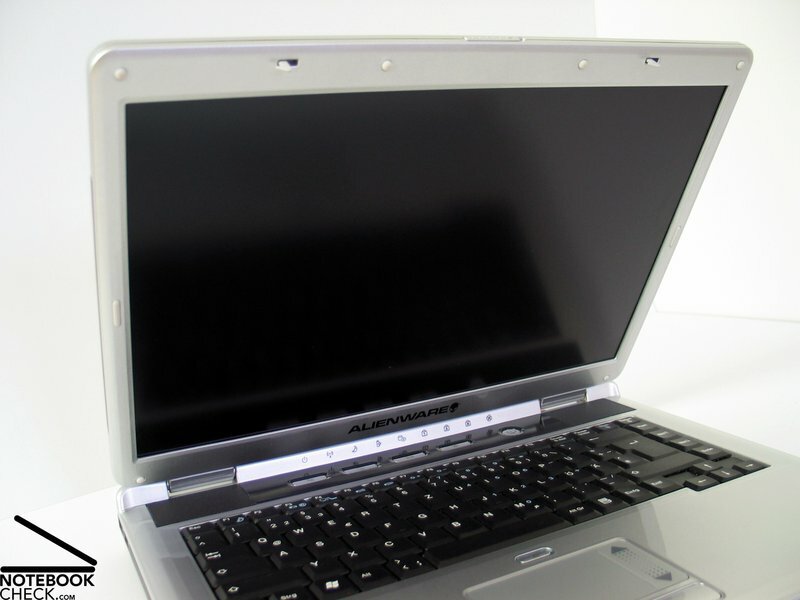 The equipment starts with a Core 2 Duo T7600 CPU with 2.33GHz. Undoubted, the most powerful processor available today. Even regarding the main memory the producer did not save at all. 2GB DDR2 PC5300 Dual Channel militate for themselves. 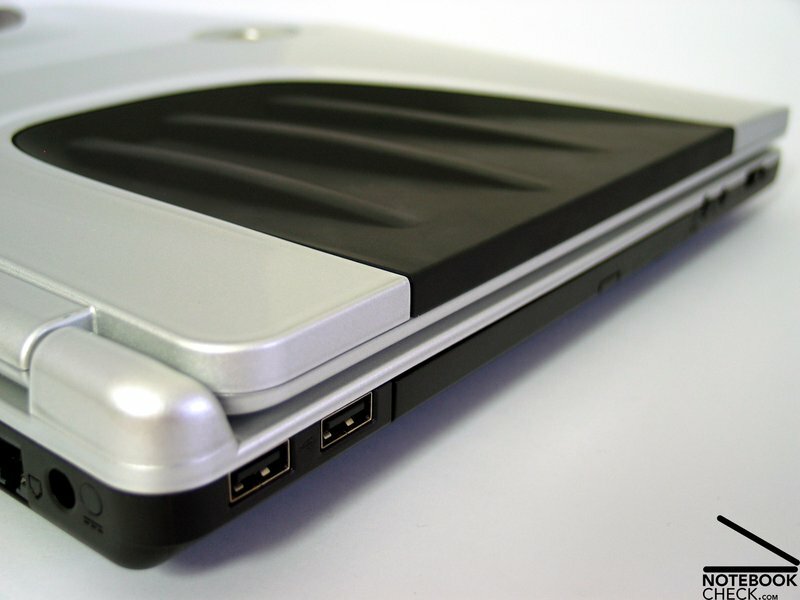 Furthermore, a 80 GB hard disk with 7200 revs guarantees high transfer rates and low access times. 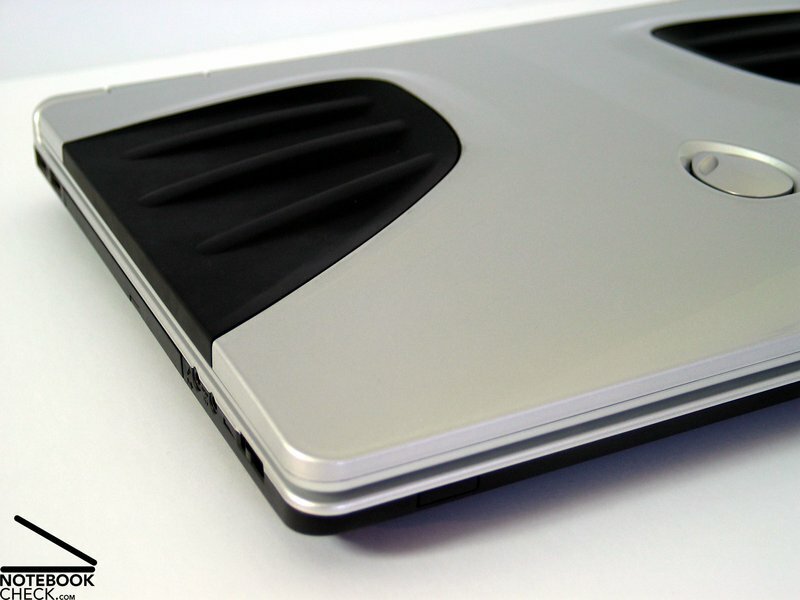 The notebook is complemented by a NVIDIA Geforce Go 7600 video card with 256MB video ram. 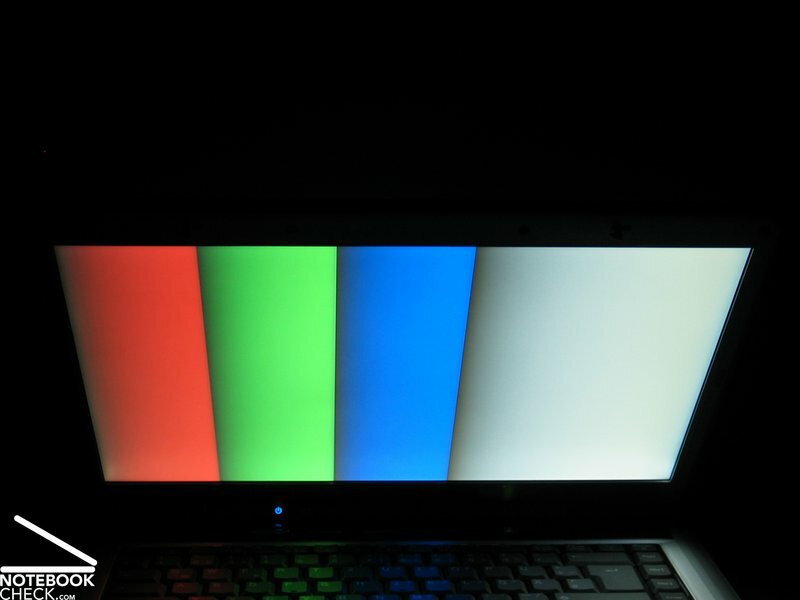 The video card used is a middle class model, which should be sufficient for current games, however, one might need to reduce the resolution or the number of details. Regarding video processing, it is a high-performance CPU-GPU-HDD combination. However, the available hard disk memory of 80GB (max. 100GB 7200 revs, 120GB 5400 revs) could be a bottle neck. It's clear that such a high-end configuration costs a pretty penny. 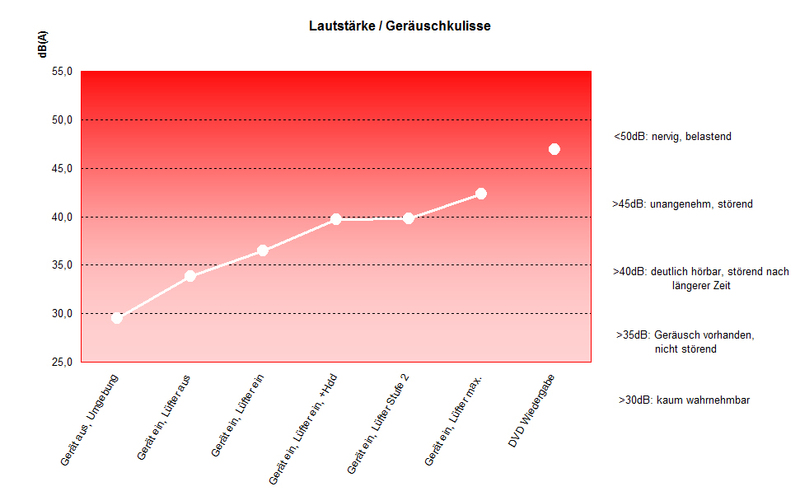 Even the Alienware Homepage (1.094.- Euro and more) cannot belie this. The reviewed equipment costs 2.626.- Euro. Further information about the video card can be found here or in our comparison of mobile video cards. 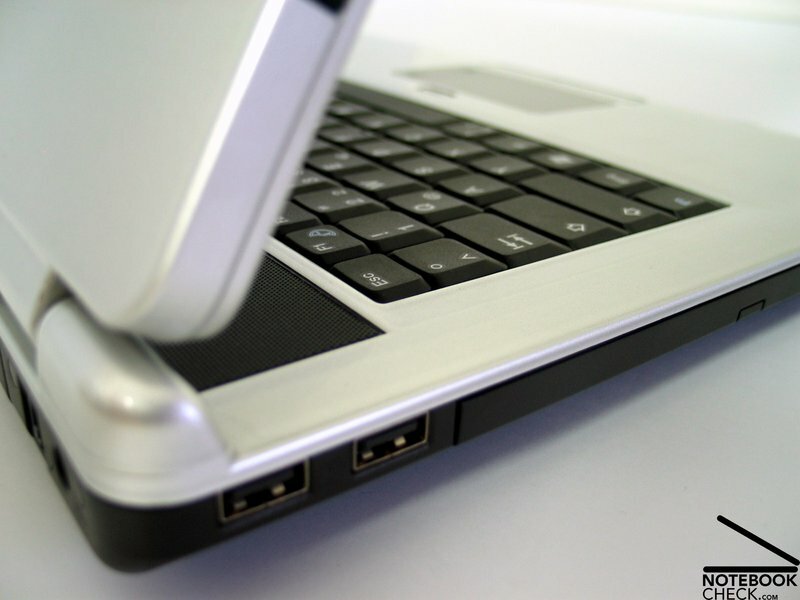 Detailed information about the Core 2 Duo CPUNotebook Processors can be found here. During operation without load one can live with the noise of the permanently running fan (Level 1 36.5 dB). Obviously, the noise is rather high-frequent. By pressing the button with the fan symbol, the CPU performance can be limited and therewith also the loudness. This makes an operation without load at a noise level of 33.8dB possible. Under load the fans run nearly all the time at a loudness of 39.8 dB. During our reviews we measured up to 42.3 dB. Sometimes, we observed a high-frequency whirring, but we were unable to localize its origin. During DVD playback the drive is extremely loud at up to 46.9 dB. Therefore, we recommend using additional software in order to control the optical drive. Apropos drive, the fast 7200 revs hard disk clatters and crackles a little bit during use. 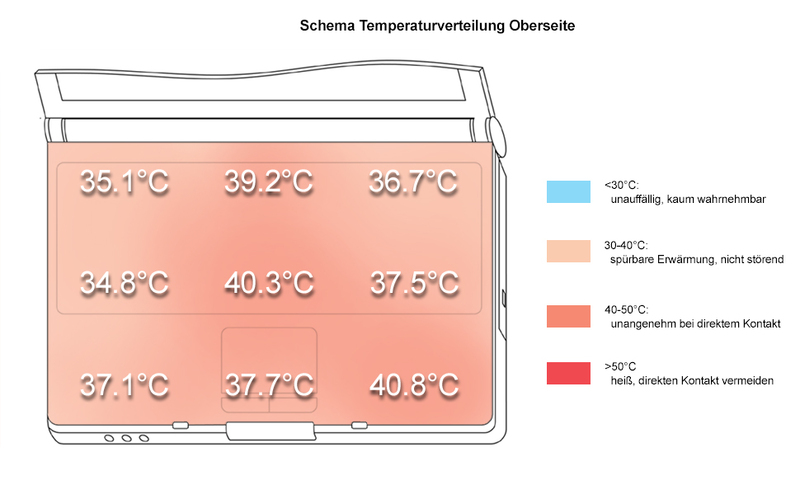 Regarding the maximum surface temperature the Alienware S-4 m5550 established an unpleasant record of 53.8°C in the center of its bottom side. If one considers that the flow temperature of heaters is about 60°C and more, this value is rather alarming. Therefore, it is actually not possible to use this notebook on ones laps or on soft surfaces. We reviewed the notebook on a standard wooden desk and could not observe any performance losings caused by the high temperature emissions. The speakers, which are placed left and right above the keyboard, could not convince us. They sound rather tinny and faint, without any basses. However, the maximum volume is alright. The Alienware S-4 m5550 feels best at a desk, preferable next to the power supply. 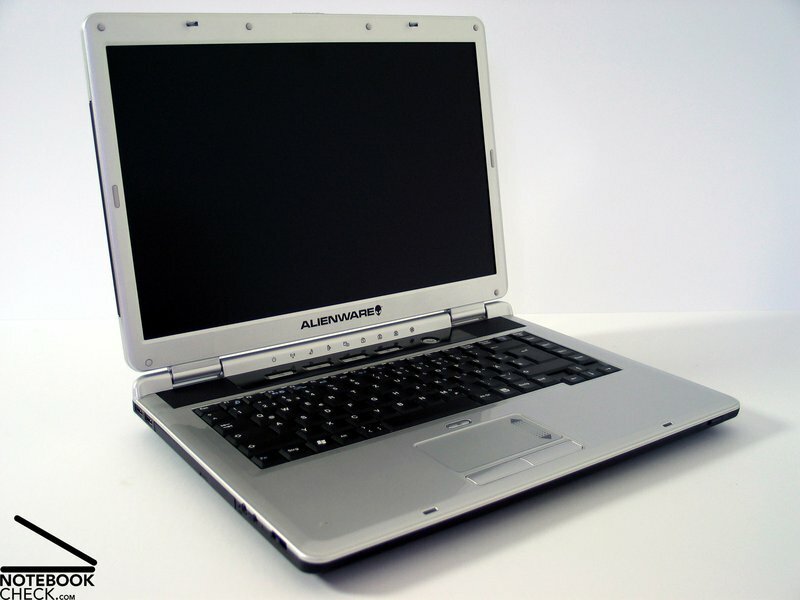 The maximum runtime is nearly 2 hours, the minimum under load only one hour, therefore, the notebook's mobility is remarkably limited. During DVD playback the runtime is about 80 minutes, therefore one should rather try short series than classical movies. 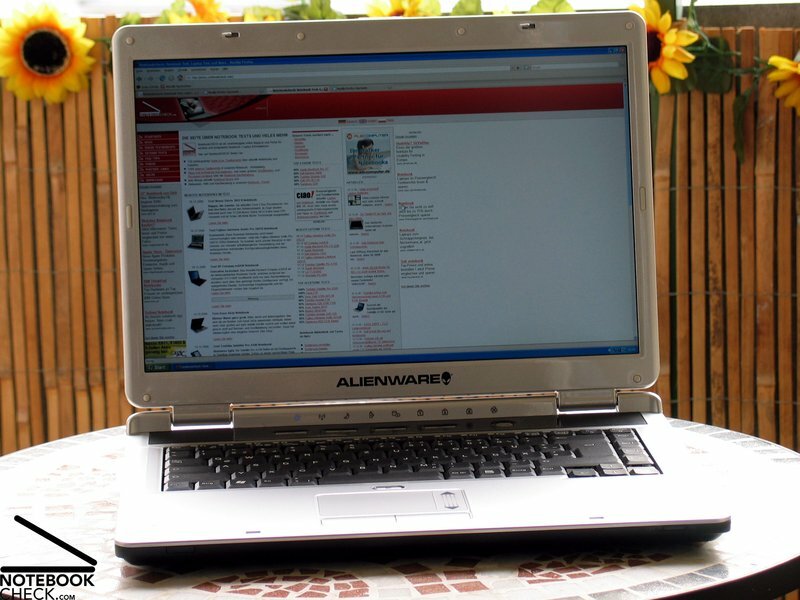 The Alienware S-4 m5550 could be well called notebook of records. Most of the time in a positive sense, but not always. 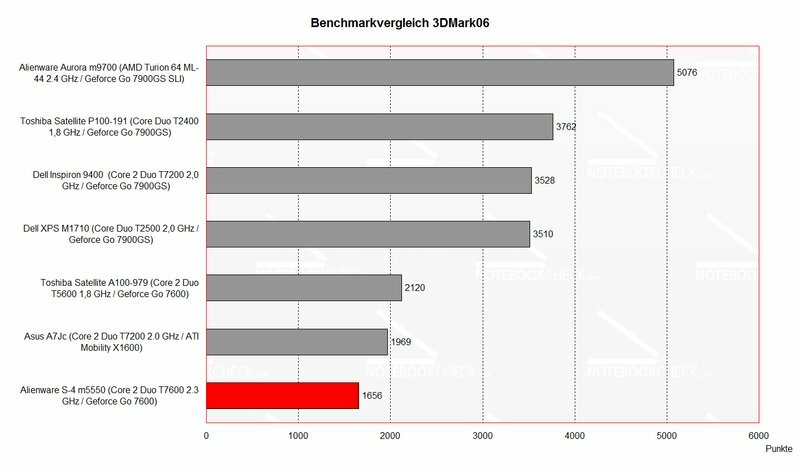 One of the notebook's advantages is obviously its outstanding performance, as a result of an excellent CPU and a high-quality hardware configuration. 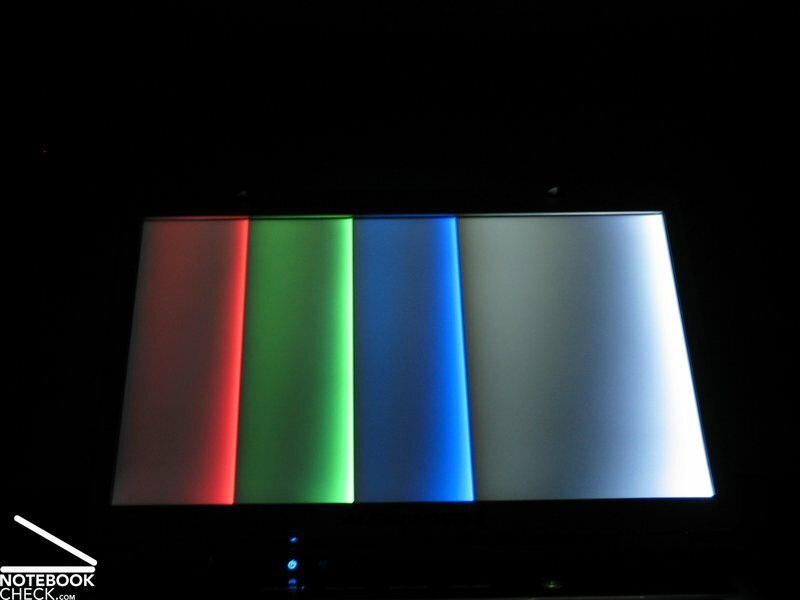 Another plus is the 1920x1200 pixels 15.4 inch display with non-reflecting surface. Brightness and illumination are alright, the contrast was especially good. The notebook's emissions belong to those aspects, which are not that delighting. E.g., the DVD drive is one of the loudest we had in ours reviews so far. However, the noise emissions of the fan is in respect of the performance by all means alright. Quite the contrary is true regarding the notebook's surface temperatures. With a measured value of clearly above 50°C at the bottom side the S-4 m5550 takes a top position in the ranking of mobile radiant heater. 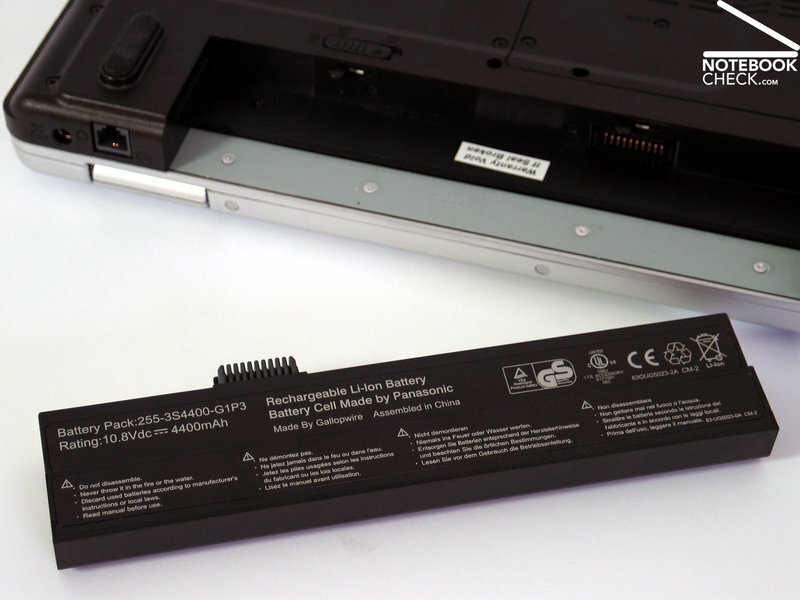 The battery runtime is, considering that it is a 15.4 inch multimedia notebook very moderate. 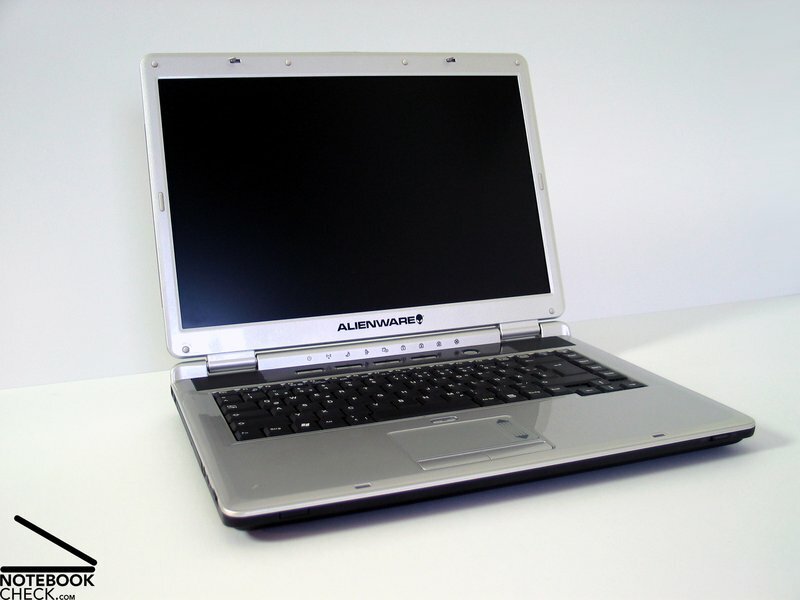 Generally, the S-4 m5550 would fit better into the class DTR notebooks, which is indicated by an essentially better rating (84%) in this category. 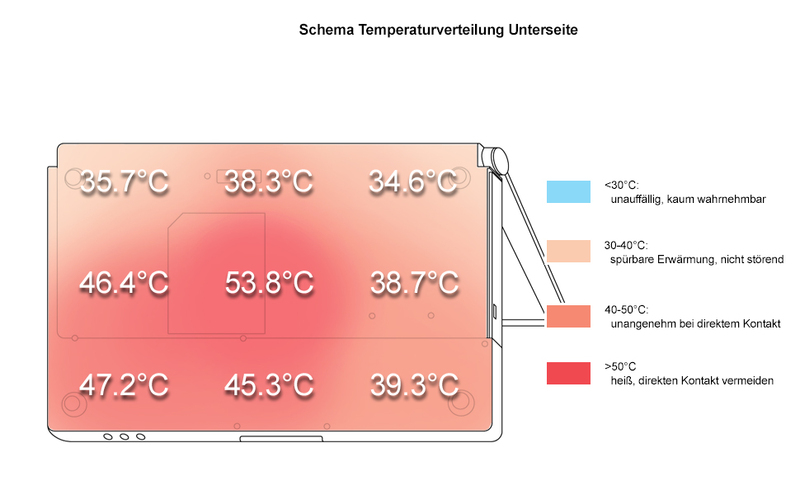 The reason is that the temperature and the battery runtime are given less weight in this category. The fan's noise emissions are yet alright, but, the measured maximum surface temperature was the highest so far. 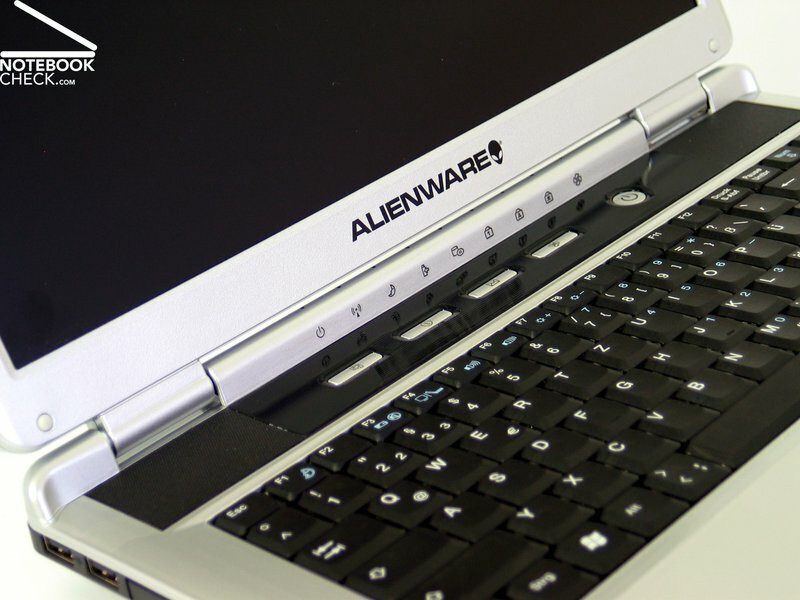 The same is true regarding the notebook's performance, which sets new standards due to the Core 2 Duo CPU T7600. The 15.4 inch display with a tremendous maximum resolution of 1920x1200 pixels impressed us. ...so, it is comfortable in use. 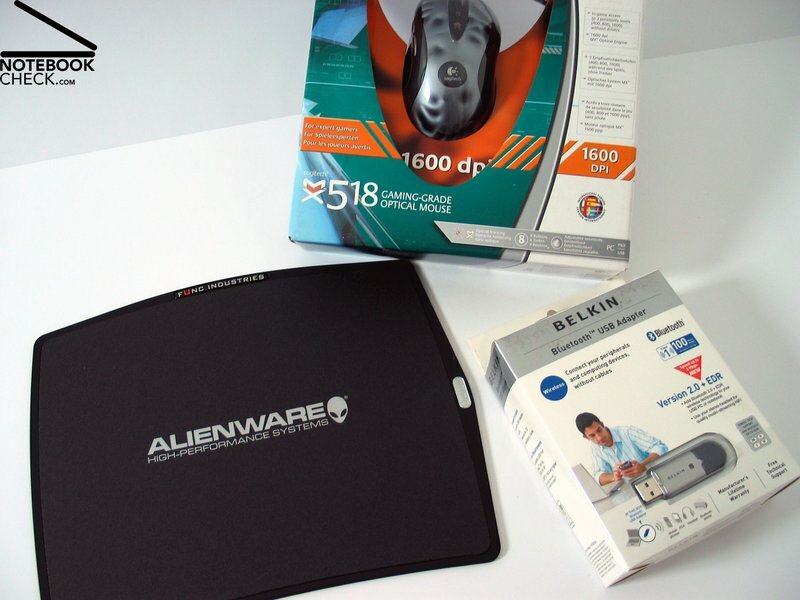 In a really huge box there are a lot of accessories, e.g., a Bluetooth adapter, a mouse and a mouse pad. ...among others a DVI port. in general the notebook is sufficiently robust. 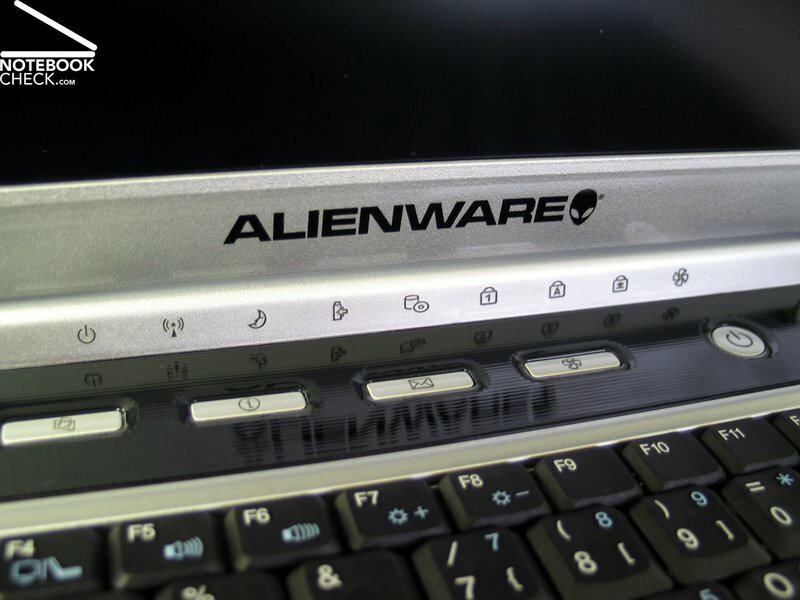 ... the Alienware S-4 m5550. The 4400 mAh battery with a maximum runtime of 2 hours, limits the mobile.